Bitmain, the Chinese crypto miner maker, looks like it has reached an interesting point in its pathway to going public. There’s been little heard since the company filed to go public in Hong Kong in September, but now it appears that a new CEO has been hired and its two founders are leaving. The publication said that it isn’t clear when a new CEO will be named, or indeed whether an outside appointment will be made. Bitmain declined to comment on the report when asked by TechCrunch. The company, which is said to have been valued as high as $15 billion, certainly appears to have stalled with its IPO following the filing of an application on September 26. That document opened up a treasure trove of financial information regarding the company, which is estimated to supply around three-quarters of the world’s crypto mining machines. Indeed, Bitmain’s IPO filing showed heady growth in revenue. The company grossed more than $2.5 billion in revenue in 2017, a near-10X leap on the $278 million it claimed for 2016, while sales in the first six months of last year surpassed $2.8 billion. However, there were no figures for Q3 2018 and, since September, the price of Bitcoin and other cryptocurrency has plummeted further still, therein reducing the appeal of buying a mining machine and likely impacting Bitmain’s sales. 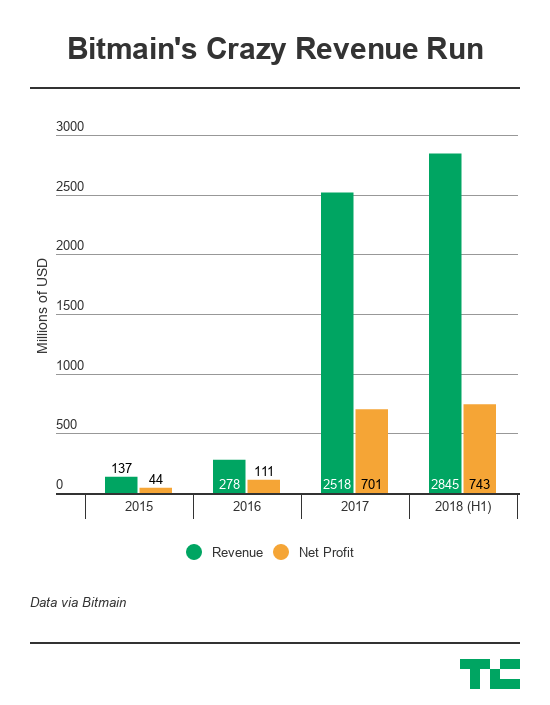 Bitmain saw impressive revenue growth as the crypto market grew, but it isn’t clear how the business weathered the price slump that affected the market in 2017We reported that the company likely made a loss of around $400 million in that Q3 quarter. Things are likely to have been trickier still in Q4, as crypto prices dropped so low that mining companies in China were reported to be selling off machines because the cost of power to mine was lower than the reward for doing so. Bitmain has diversified into non-mining services, to its credit, but its efforts to grow Bitcoin Cash — a controversial fork of Bitcoin — have been controversial and likely loss-making, to boot. The price of Bitcoin Cash is currently $162 at the timing of writing; that’s down significantly from around $2,500 one year ago. That doesn’t bode well for Bitmain’s investment into the cryptocurrency, and it likely explains why the company has made layoffs, like others in the crypto space. What a difference four months can make. The challenge for the company’s (apparent) new CEO is certainly a daunting one. But Bitmain’s struggle isn’t unprecedented. Just this week, its closest rival — Canaan — was linked with a U.S. IPO. The company had planned to go public in Hong Kong last year but it allowed its application to expire as crypto market prices went south. There’s plenty to watch out for in the mining space in 2019! Editorial note: The author owns a small amount of cryptocurrency. Enough to gain an understanding, not enough to change a life.